After setting up hwe-s for precise along with the doc below, `juju add-machine` fails with "Failed to bring up br0". Then lost connectivity to a node. I'm using fastpath-installer, d-i is not tested yet. 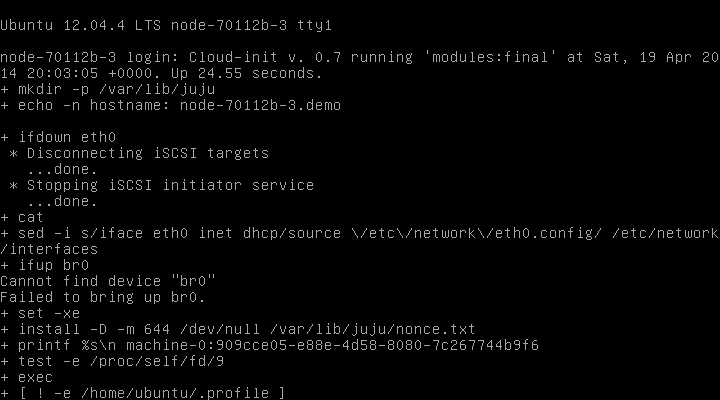 After changing "/etc/maas/preseeds/curtin_userdata" to use default archive not ports.ubuntu.com for hwe-s, `juju add-machine` succeeded. The kernel was still 3.2 not hwe-s though. d-i case was filed as Bug #1310082. From the log of curtin manually kicked inside maas node, curtin is trying to install lts-saucy but fails. Tried to install kernel linux-generic-lts-saucy but package not found. If I manually put the content below in /etc/maas/preseeds/curtin_userdata, curtin installs lts-saucy kernel. However curtin seems to have implementation of auto-detect feature above. Somehow it does not work. The reason auto-installation lts-saucy does not work in my environment was that the result of "in_chroot(['apt-cache', 'search', package], capture=True)" was empty. i.e. "apt-cache search linux-generic-lts-saucy" returns empty result. To put `apt-get update` before the line works for me as a workaround (apt-get update runs twice before and after `apt-cache search`). I'm not sure this is a issue in curtin or in maas tarball image. I am attaching a fix for the part of the problem that's in maas/preseeds/curtin_userdata, in the maas source tree. This won't be enough to fix the whole problem, so I am not marking the branch as “fixing” this bug. Why not make 'arch' actually mean 'arch' and 'subarch' mean 'subarch' as variables available to the template. in response to comment 5, i'm not sure why the cache in the image wouldn't have had either been updated or have had sane values built in. that could be an image-build thing. Scott, is this a Curtin bug as per comment 6? I just verified that it's broken - the installer comes up with the hwe-s kernel but installs the release series one. Note that only the MAAS part is fixed, Curtin still needs a fix.